“This is how it was” opens Meir Shalev’s aptly titled, in both Hebrew and English, airy memoir, My Russian Grandmother and Her American Vacuum Cleaner, in which he unfolds a family tale about his compulsively neat grandmother, Tonia. In fact, the original Hebrew title, Ha’davar Haya Kakha, translates literally to “This is how it was,” a line often used often by author Shalev’s grandmother to introduce family stories. Meir Shalev, an experienced, smooth, studied writer, constructs a well-written and constructed narrative about a relatively mundane drama: his grandmother’s acquisition of an American vacuum cleaner in late 1930s Palestine. In many ways, his narrative is too studied and reads like a model for a creative writing class. Mr. Shalev begins his memoir with an amusing anecdote about himself as an adult, which illustrates his eccentricity and concludes his mini story with a quotation from someone in his audience, who observes, “’What do you want from the guy? He got it from Tonia. She was crazy in just the same way. That’s the way it is in their family.’” After so neatly introducing (and promoting) himself, he smoothly begins the story of his “distinctive” “character” of a grandmother, Tonia. Throughout his memoir, Mr. Shalev often reminds the reader that he is constructing a tale. He self-consciously jumps back and forth between different time periods and scenes to provide background information and fill in his narrative but also brings the reader back to the main character(s) in the story—those characters being Tonia and her vacuum cleaner. After digressing a bit, Mr. Shalev writes, “But this, too, is not part of the story I am trying to tell here, the story of a vacuum cleaner sent to her by her brother-in-law from America.” In the middle of other peripheral stories, Mr. Shalev comments, “which I shall explain later,” or “but I will get to that later,” and “about which I shall also tell later on,” all of which lend and air of casualness to the narrative but seem overly contrived and affected. The catchy, funny title for the translated American edition of Mr. Shalev’s memoir reflects the light, amusing tone of the narrative, as does Evan Fallenberg’s deft translation of Mr. Shalev’s tale. Fallenberg mirrors Mr. Shalev’s easy-going, lively style and manages to capture the idiosyncrasies and the accents and idioms used by many of the characters. 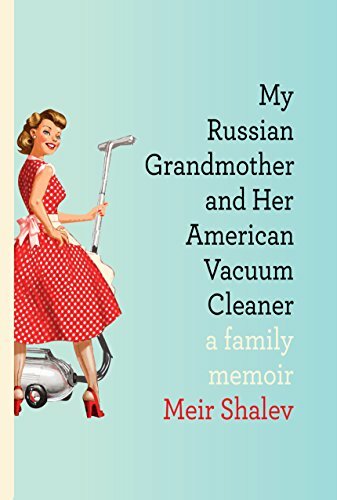 However, My Russian Grandmother and Her American Vacuum Cleaner is not merely a tale about a tidy grandmother who receives a modern appliance from America. It is also a story about Mr. Shalev’s family, which settled in Palestine before it became the state of Israel, and it is also a light, sketchy history of the pioneers who established homes and communities on the land and built modern-day Israel. Unfortunately, My Russian Grandmother and Her American Vacuum Cleaner does not include enough historical substance, nor interest or drama to sustain the catchy premise. The characters are largely two dimensional; the reader never really gets to know much about any of Mr. Shalev’s relatives other than his or her trademark quirks or role in the family. Most people have eccentric relatives who amuse their families but don’t quite provide enough fodder for a memoir or biography. The book is not quite a biography, autobiography, or a memoir. Unlike a biography or autobiography, it does not really provide a full account of a person’s life—neither of his own nor of Grandma Tonia’s—but, yes, perhaps of the vacuum cleaner’s. And unlike a memoir, it lacks a real and engaging central drama.